Everyone wants a moist, tender, delicious Thanksgiving turkey - so what's the best way to achieve that goal? Chef Richard Erickson shares his thoughts on both brining and "dry-brining" in this post. He also shares his brine recipe, which is an excerpt from our Feel Good Food cookbook. Wishing you and your family a very Happy Thanksgiving. There's a lot of debate in the media these days about the best way to create the perfect, moist turkey we all crave for Thanksgiving dinner. Brining has been the shining star featured extensively over the last 20 years, but now many people are debunking it in favor of other techniques, especially one called "dry brining" or "dry rub" technique. Chef Richard chuckled when I read him that phrase from an article the other day and said, "Oh you mean the technique that's been used for centuries to cure meat"? Essentially what's now being termed "dry brining" is rubbing the outside and inside of the bird with a nice coating of olive oil, kosher or sea salt, chopped fresh sage and/or thyme, and letting it sit out for 24-48 hours uncovered in your fridge. There's no real secret to this, and it's been used for years as a way of seasoning many cuts of meat as well. This technique will yield a deliciously seasoned bird and a nice, crispy skin which is highly coveted. Ultimately, however, our chefs still prefer to soak the birds we cook and sell in brine for a few days as a way of insuring the meat will stay moist, especially because our customers will be reheating what they buy from us when they get home. So what exactly IS a brine? The word itself seems old-fashioned and it is. A brine is salt water with sugar added to temper some of the harshness, then herbs and spices are added to enhance the flavor. Modern chefs have adopted the technique relatively recently to correct for the lean pork and poultry being raised commercially. Turkey that is cooked over 150 degrees has all the juices squeezed out as the meat contracts during cooking. 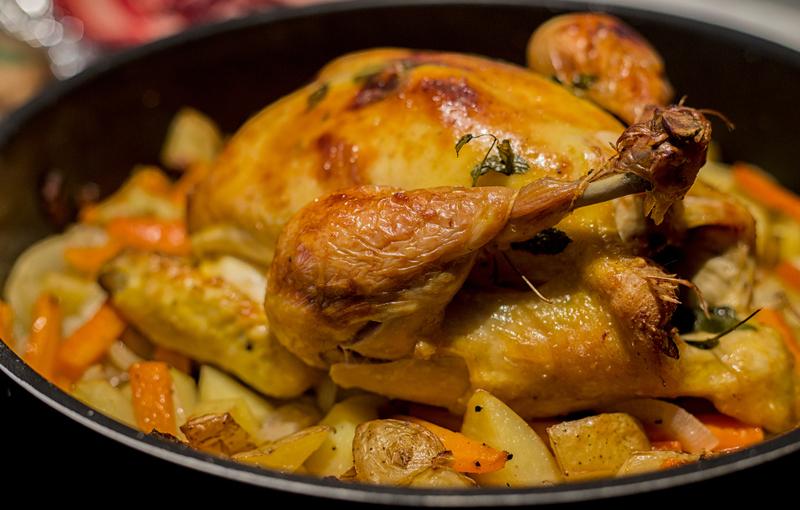 Brining will counteract that and give you a juicy, tender and flavorful bird. Really!! Once you've mastered your turkey this Thanksgiving, keep some brine in your refrigerator and next time you're making pork chops or chicken breasts, brine them overnight and you won't believe how much more delicious they'll be. Bring water to boil with salt, sugar, herbs and spices. Crush the head of garlic, add 3 or 4 bay leaves, a good branch of thyme, sage or rosemary and a sprinkling of peppercorns. Let simmer for 10 to 15 minutes and then cool. Add two gallons of cold water less 2 cups. Remove the neck, giblets and liver from the cavities or the turkey, rinse and put into a large pot or plastic pail that will hold the turkey comfortably and cover with the cooled brine, put a plate on top to keep it submerged and leave refrigerated for 24 to 48 hours depending on the size. It is important that it remain at 40 degrees or less. Remove from brine, pat dry and roast in the usual way however do not add salt, the bird has already been seasoned. Rub the skin with a bit of oil and some of the herbs used in the brine. Internal temperature should be 145 when done. Allow to rest for at least 30 minutes after removing from the oven before you carve and serve the turkey. Now enjoy one of the most tender and delicious turkeys you have ever had. This recipe also works well for chicken and pork, soak for shorter periods of time depending on the size of the piece of meat. You can also add brown sugar, apple cider, mustard seeds, cinnamon, and / or cloves. The variations are endless so have fun with this and don't worry - be happy - and enjoy! Bring water to boil with salt, sugar, garlic, spices, and herbs. Let it simmer 10–15 minutes and then cool. This keeps indefinitely in the refrigerator in a nonreactive glass jar. Each time you need to brine something, combine 1 part brine concentrate with 8 parts cold water. Meats need to be covered completely with liquid during brining. A 3 1/2 lb chicken might take 2 qts, for example, whereas a large turkey would probably use the entire 2 gal. Boneless chicken breasts or pork chops can benefit from as little as 2–3 hours of brining. Larger items, such as whole chicken, turkey, or a pork roast, are best brined overnight. It is important that whatever is being brined remain at 40°F or less (i.e., refrigerated); brining is not preserving. When you are ready to cook the brined item, remove it, rinse well with cold water, and pat dry. Cook in the usual manner, however, do not add salt as the meat has already been seasoned. Brown sugar, apple cider, mustard seeds, cinnamon, or cloves may also be added to the brine depending on the final preparation. Want more delicious Thanksgiving recipes? We've got lots of them in our Feel Good Food Cookbook. Get a copy here.